The thing about musique concrète is that it makes you listen. Hard. When the relationship between what you hear and what you see is removed or distorted, your ears awaken. Langham Research Centre, ‘Britain’s leading musique concrète performing group’ at Bart’s Pathology Museum was a glorious, eclectic elixir of curiosities. Tonight, in this vast Victorian space on three mezzanine levels, Nikola Tesla rubbed shoulders with JG Ballard. Oscillators and cassettes mingled with 5000 anatomical specimens hovering in formaldehyde. Speakers and cables jostled with 120 year old paintings depicting graphic detail of incurable ailments. We sat on the floor, on chairs or wandered around. It had all the intimacy of chamber music, the friendliness of a family barbecue and the strangeness of a sort of pathological Alice in Wonderland. What happens when we put music into unusual spaces? It’s a practice that festivals and curators are adopting more and more. It’s good for attracting new audiences who may be put off by the stiff formality of a concert hall or who may be primarily drawn to the space itself. I’m interested in how the two work together. It was smart of Spitalfields not to harp on about academic or aesthetic connections between the music and the Museum in the programme notes. You don’t have to force things when two such fascinating worlds collide. One thing I’ve learned is to let audiences find their own meanings. But what I really find intriguing about Langham is the ‘mismatch’ of sound and sight. You experience this most in their own compositions. The music intensifies, swells, recedes, it is rich and resonant, tense, gentle. And yet, there is no visual response. Langham players sit at desks and do small things with oscillators and tapes that you can’t quite see. They don’t break a sweat. They don’t gesticulate or cue or look pained. You can’t really tell how well it’s going. Now I usually rather like a bit of reassurance that all is well – I’m the kind of person who closely scrutinises the faces of the air hostesses during turbulence. But rather than adding up an impoverished performance, the lack of gesture in fact serves to sharpen your ears. Anyone who doubts that musique concrète can be moving or emotive needs to come and hear Muffled Cyphers (2014) or Langham’s new work, The Dark Tower (2016). Shut your eyes and you’re right down that rabbit hole….this path or that…curiouser and curiouser… a grammar-free, dreamscape layering of sound that is suggestive rather than prescriptive. It’s a collage of stories, woven together, that draws you into a uniquely different world. 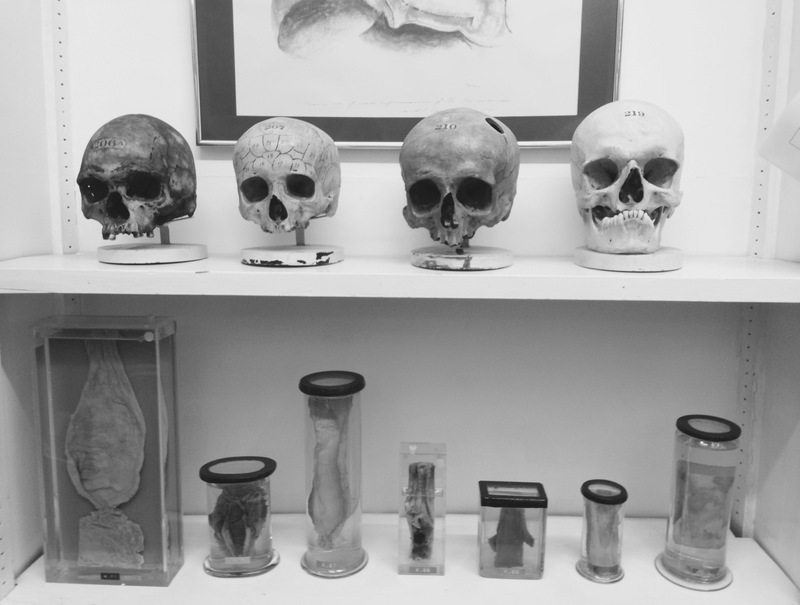 And what of the Pathology Museum? Each time I opened my eyes I found myself making a rather different set of connections – what I was hearing with what I was seeing. The sounds suddenly had a new set of meanings: unsurprisingly, quite grizzly ones. The buzzing nail file became a saw, the motors became a dentists drill, the clipped beeps of the Wolff became a life support machine, the voices of Muffled Cyphers were the sounds of the living and the dying. I think this is the great strength of concerts-in-strange-places. They open up narratives. They prevent music from existing in a purely linear fashion and encourage us to notice connections between sounds and material things. I love the freedom of choice in this sort of event: I am my own curator here and the choice of which of the 5000 glass jars I focus on ensures that my experience is unlike anyone elses. It’s a generous concert that allows audiences to be creative too. Lets have more of that.